Indeed. We woke this morning to see the mist descend from the mountains and envelope us like a glove, bringing with it sudden cool weather on this third day of autumn. This meant us having to improvise again, abandoning our original intentions to head to the Moses Cone Memorial Park for a walk along one of its carriage trails. If there’s one thing we’ve learnt on this trip, it’s to let go of our expectations and see where things take us. True enough, a pleasant surprise awaited us at the Blowing Rock instead. We decided to go ahead and pay the entrance fees despite the overhanging fog. We were told, we would be able to see the rock, but not the view. Known for being North Carolina’s Oldest Travel Attraction, the legend of Blowing Rock goes way back before its establishment in 1933, almost 250 million years ago when the Blue Ridge Mountains were forming as plates collided and the earth’s crust folded to form this metamorphic rock, called gneiss. There is also the Romeo and Juliet-like legend of the Cherokee brave, who, torn by duty and his love for a Chickasaw Chieftain’s daughter, leapt off the rock, only to return one day, blown by a gust of wind back onto the rock. Our outing to Blowing Rock turned out to be one of our most restful trips. The kids loved the thrill of rock climbing. We tried to test this phenomenon but to no avail. Our leaves continued their fateful descent to the bottom of the gorge. Thanks to the mist, however, we were able to capture some atmospheric family pictures which will make the grandparents tremble, as the boys seem perched precariously on the edge, ready for a gust of wind to blow them onwards. Our 8-year-old with his unique sense of humour. This turned out to be one of his favourite experiences for the entire trip! 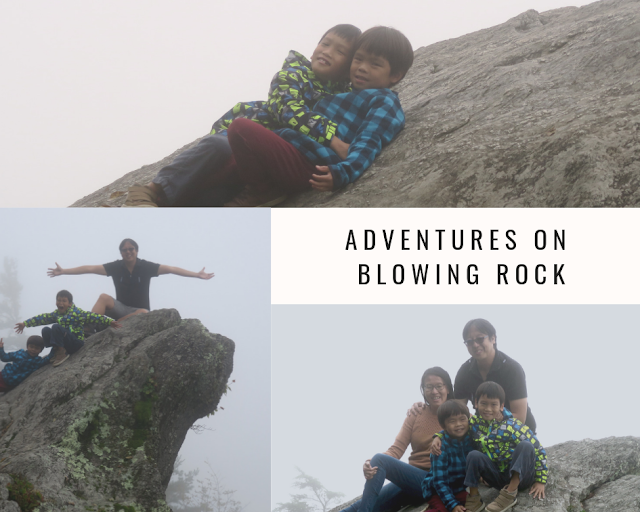 The kids couldn't get enough of their beloved Blowing Rock, spending most of the morning clinging to the rocky surface! 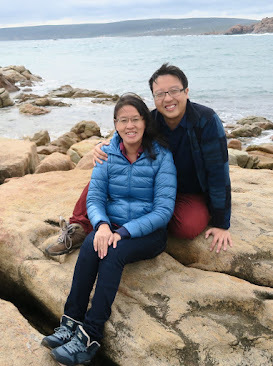 We headed out of the dampness and into the Tanger Factory Outlets to do some shopping, hoping to watch and see if the fog might lift. The inclement weather continued, so we drove on to the rural national historic town of Valle Crucis, known in English as the "Valley of the Cross". Idyllic pastoral scenes went by us, and we spotted our first graceful deer as it crossed the road right in front of our car! We took in the scene and managed to catch the Mast General Store, established in 1883, before it closed at 6.30 pm. 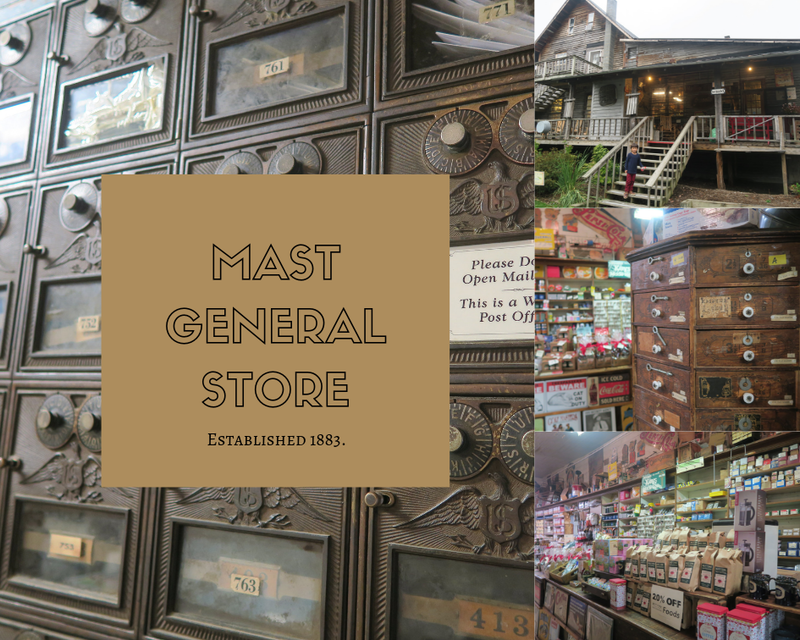 We breathed in the air of history in the establishment, stocked with every item imaginable as it has been for almost 140 years. The prices were reasonable and the nostalgia great - the potholder looms, Glo Worms and Chinese Checkers brought me back to my childhood. It is definitely worth a visit, if not just for the opportunity to take a trip back in time. The Previous Page - Of Sweet Lips 'N Bluegrass. Read here. The Next Page - Chasing Grandfather Read here.